Future climate projections predict that some parts of New Zealand will become drier with droughts being more severe and frequent. This is particularly true for the north and eastern parts of the country. We know that soil moisture availability will decline due to reductions in rainfall and increased evaporative demand will lead to faster transfer of water back to the atmosphere. However, we do not yet fully understand the impact of climate change on water balances of vegetated catchments. In forested areas, a large proportion of rainfall (up to 90% or more) is lost back to the atmosphere as evapotranspiration, the sum of loss of water through plants (transpiration) and evaporation of water from bare soil. Transpiration is the dominant component of evapotranspiration. The amount of water remaining after evapotranspiration (often known as the water yield) changes because plants respond to environmental conditions such as soil moisture and atmospheric evaporative demand. Climate change conditions often lead to reduced tree water use but during dry periods, the proportion of rainfall lost to the atmosphere often increases. Where Q is the water yield available for human use, P is the precipitation and ET is evapotranspiration. 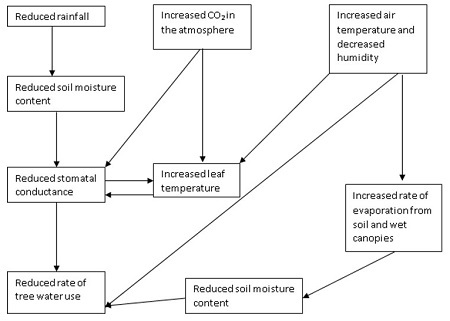 The interplay between rates of evapotranspiration, climatic conditions and plant functional responses to climate is summarised in the following diagram. In general, tree water use will decline in future climates as rainfall declines, CO2 increases, air temperature increases and humidity decreases. Schematic diagram of relationships between tree water use and changing climatic conditions. Reproduced from Macinnis-Ng and Eamus 2009. What does this mean for catchment water budgets? In a semi-arid area of Australia, evapotranspiration accounted for around 90% of rainfall during a non-drought year, increasing to 98% of rainfall during a drought year. This leaves very little water for other water requirements of a catchment such as river flows or groundwater recharge because when rainfall declines, the proportion of rainfall used in evapotranspiration increases. This type of scenario occurs in dry climates or during periods of low rainfall but the situation in New Zealand remains unquantified. Very few studies have investigated the seasonal and inter-annual variation of transpiration in our vegetation. Plants adapted to drought conserve water by closing their stomata (leaf pores) during dry periods but we do not know if native species have water saving strategies. Seedling trials suggest there is a wide range of physiological responses to drought ranging from water spenders to water ‘super-savers’. But field measurements on mature plants are required to determine the physiological responses to drought and the resulting effect on catchment water balances. Our research is exploring the water relations of native trees and seedlings to identify the varying sensitivity of different species to drought and eventually determine the impact of climatic changes on forest water balances. Sap flow sensors are monitoring transpiration of kauri and associated trees 24 hours a day. Together with meteorological and soil moisture data, this information helps us understand the responses of trees to varying soil and atmospheric conditions. In addition to quantifying the forest hydrological cycle, our research will help us determine whether Northland forests are vulnerable to drought-induced forest dieback. Dr Cate Macinnis-Ng is a Senior Research Fellow in Plant Ecophysiology in the School of Environment at the University of Auckland. You can follow her on Twitter @LoraxCate. Yes, I agree with he general considerations. However, how much reliable are the estimations of water losses by evapotranspiration. A part for reading the budget equations papers rarely explains how single terms in the budget are really evaluated. My impression is that the accuracy of the estimates is quite low.